I grew up in a small country town in Poland, where life was pretty simple. People would know all the neighbors, they would pay each other visits every week to talk about what’s been going on in the community and to have a beer or two. It all seemed great until the moment when I got a bit older and went to Junior High School. My hair, unlike all other boys’, was long and I enjoyed listening to rock / metal music, the genre that was considered weird, unknown, maybe even evil. Suddenly this friendly community started treating me like an alien, someone they refused to treat as one of their own or spend time with. Almost every day I would get some beatings from school bullies, they would pull my hair, call me names, in short – my life became miserable. I had to find a way to survive, something to focus on. That’s when I started spending even more time with my computer, playing Diablo (I even set up a Diablo fan club which became quite popular in Poland) and other multiplayer games that connected me with new people. All these interesting personalities living there, somewhere far away, (and the unforgettable sound of a dial-up modem) made me believe there was something good out there waiting for me. Next, natural step was the analysis of how a game could be created. I spent months looking at the code and analyzing its components. There weren’t many tutorials back then, so sometimes it took a while to figure things out. But it all led to building my first website, which was full of tables and hundreds of colorful elements, everything was there! I was so proud of myself! When I went to High School, I already knew a thing or two about coding and I wasn’t afraid to use it! I moved to a big city, got my first job as a graphic designer and started renting my own apartment. I was very young, full of energy and determination to change my life. After a while I got another job and another, and suddenly I realized that coding became an essential part of my life. Instead of learning chemistry and biology, I spent my nights learning new ways of improving my skills and finally was offered a pretty sweet job in a huge company, where I led a team of front-end developers. Yes, I was about 19, but I felt so mature. It’s so funny now, when I recall that feeling of accomplishing “everything”, but hey, I knew CMS ‘hacks’ on IE 6, I knew it all! Of course, I had heard of WordPress, but none of the ‘true’ coders would use it, so why would I want to dig into that? Well, I’m glad someone helped me change my mind. In 2010 my colleague invited me to join him on WordCamp. In Poland WordPress was still considered a cute little tool for creating internet blogs, so I thought going there would be a waste of time, but it turned out to be a life-changing experience. The opportunity to meet people from different countries, hear them talk about the growing possibilities of WordPress made me realize I was in the right place. The fact that a few people I met there are still my friends today only stresses the importance of that event. It simply dawned on me that it’s not really about the CMS or other technical elements. 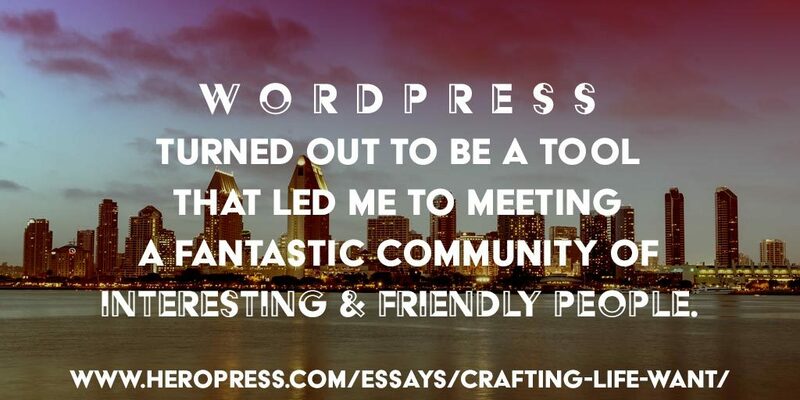 WordPress turned out to be a tool that led me to meeting a fantastic community of interesting and friendly people. And this was one of the reasons I wanted to delve further into WordPress. Two years later I started cooperating with a company based in the United States. Their main tool to build sites on was WordPress, obviously. By the way, I’ve been with this company for over 5 years now and to be honest, I can’t imagine my life without those guys now, but I don’t want to keep you here too long, so let’s move on. I quit my safe, ‘nine to five’ job to the dismay of my parents and started working remotely. Everything was so new, so exciting, but at the same time physically and mentally exhausting. I was doing my master’s degree in e-business and I rarely slept through the night, mostly because my clients were from different time zones. To make things more exciting, I applied for a grant from the European Union and registered my own little company in Poland. But hey, I still felt unsated. It took me around a year to decide to move my company to the United States and go there to manage it. Actually, part of this time was spent on convincing my wife to quit the job she didn’t like anyway, but again, no subplots. To say that moving to the States was easy would be a monstrous lie. Dealing with visas and all types of immigration documents is very time-consuming and caused us way too many sleepless nights, but eventually we got to California! I registered my company (again! ), opened a bank account (you wouldn’t believe how difficult it was, so thank you, dear Russian lady for fighting with the system for over 2 hours! ), and looked for a place to stay. Almost 3 years have passed, I’ve been given a chance to work with amazing people whom I truly admire, and I work for and with a few startups that, I admit, are close to my heart. One of the projects my wife and I are working on is a platform (based on WordPress, of course) that will help freelancers find good, well paid projects. Again, right time, right place, no doubt about it. Very often people ask me if it’s all worth it, if I’m a masochist and enjoy burning the midnight oil, but I don’t see it that way. If I have a goal, whether it’s one to create a new website, or learn how to prepare real pierogi (dumplings) for my wife, I’m ready to spend as much time as needed to accomplish it. Sure, if it’s not something I truly ‘feel’, I might not be able to devote 100 percent of my energy to make it happen, but I like to think it’s a matter of making the right choices. I’m not saying it’s all rainbows and butterflies right now, I’m not a guy who spends his days surfing or drinking cocktails. To be honest I don’t think I’ll ever be that guy. I’m still working very hard and I rarely take days off, but at least when I go to bed I have a feeling that I’ve done all I could to help others and improve my skills as a front-ender, project manager and most of all, a human being. The post Crafting the Life You Want appeared first on HeroPress.